Comical war-date, ca. 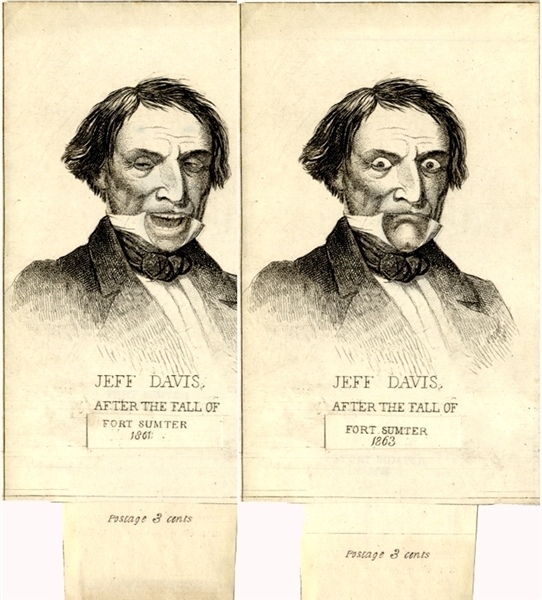 1863, Northerner propaganda anti-Jeff Davis satirical metamorphic game card showing a printed view of a smiling Jefferson Davis "After The Fall of Fort Sumter, 1861." A slight pull of slide tab at the bottom of the card then shows a grim faced Jeff D. "After The Fall of Fort Sumter, 1863." Print on the verso reads, in part: "Designed and published by D. C. Johnston…Tremont St. Boston." The card measures approximately 3" x 5 1/2". Near fine with minor stain just touching the top of Davis' head.